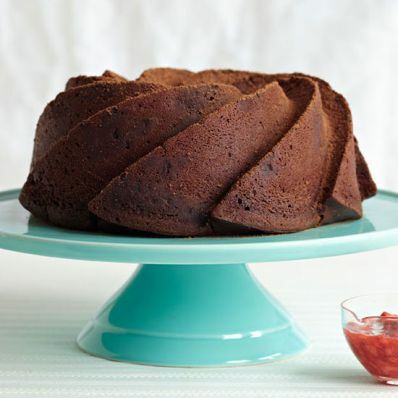 1 of 4 Heat oven to 325 degrees F. Generously coat a 10-cup Bundt pan with Baker's Joy nonstick spray for baking. 2 of 4 In a medium-size bowl, combine flour, cocoa powder, baking powder, espresso powder, baking soda, salt and cinnamon. 3 of 4 In a large bowl, beat butter until smooth. Beat in sugar until fluffy. Add eggs 1 at a time, beating well after each addition. Beat in vanilla. On low, beat in flour mixture, alternating with milk. Beat 1 minute. Scrape into prepared pan. 4 of 4 Bake at 325 degrees F for 60 minutes or until toothpick inserted in cake comes out clean. Cool in pan on wire rack for 20 minutes. Carefully trim cake level. Run a thin knife around edge of cake, invert onto rack and remove pan. Cool completely. Serve with Strawberry-Ancho Chile Sauce. Per Serving: 3 g fiber, 253 mg sodium, 11 g sat. fat, 112 mg chol., 8 g pro., 405 kcal cal., 18 g Fat, total, 58 g carb.